Eric Aho’s new paintings explore the idea of the covert, a shelter or place of escape within the woods. More broadly, these paintings are also about getting lost and taking refuge in experiences such as the enjoyment of the wilderness, the act of painting, or the contemplation of art. Aho maintains a constant dialogue with the history of art in his paintings. The Goya drawing Two Figures Pointing towards a Bright Opening (Prado Museum) served as a catalyst for the series of Covert paintings in this exhibition. The nineteenth-century ink drawing depicts two people amidst a loosely executed, indistinct nocturnal setting. Surprising and otherworldly, a white, slanting, rectilinear shape—perhaps a portal or passage—occupies the center of the composition. Resonating with Aho’s idea of the covert, this unnamable void appears in his paintings as a slab of intense white paint, a blinding, obliterating ray of light that becomes more solid and real than its surroundings. Aho’s paintings capture the lived, remembered, and imagined experience of being outdoors. Through the unexpected use of color, vigorous paint handling, and surprising compositions, his paintings make palpable the immediacy of nature and the intangibles of light, movement, and passing time. The artist’s previous body of work depicted extreme environments and events, such as blizzards, ice floes, and forest fires. In comparison, many new paintings are more tranquil and reflective. In following the course of the seasons, Aho’s subject matter has shifted toward evoking everyday encounters with and in nature. 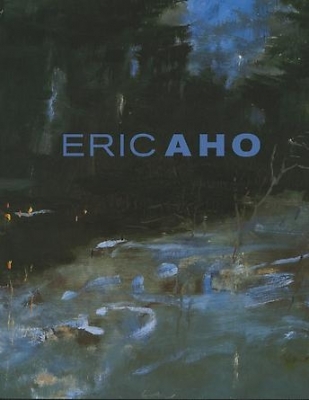 Eric Aho lives and works in Saxtons River, Vermont. After studying at the Central School of Art and Design in London, Aho received his BFA from the Massachusetts College of Art. In 1989 he participated in the first exchange of scholars in over thirty years between the U.S. and Cuba. He has also studied at the Institute of Art and Design in Lahti, Finland, with support from a Fulbright Fellowship and a grant from the American Scandinavian Foundation. Aho’s paintings have been shown internationally in Ireland, South Africa, Cuba, Japan, Norway, and Finland. His work has been exhibited in the United States at institutions including the Aldrich Museum of Contemporary Art, Ridgefield, CT; Hood Museum of Art, Hanover, NH; Portland Art Museum, ME; Ogunquit Museum of American Art, ME; National Academy, New York; and American Academy of Arts and Letters, New York. A catalog with an essay by Donald Kuspit will be available. In the fall of 2001 the Whitney Museum presented an exhibition of Jacob Lawrence’s work, including his sixty-panel Migration Series. A class of thirteen-year-old New York City students at The Calhoun School saw the exhibit. Influenced by Lawrence’s portrayal of complex events in American history, the students collaboratively tackled the telling of their own recent history—the aftermath of 9/11 as they were experiencing it.